Love | Hate: Can ‘The Powerpuff Girls’ still pack a punch? The unmistakable theme song to “The Powerpuff Girls” filled many homes from 1998 to 2005 as fans around the world tuned in to watch Blossom, Bubbles and Buttercup fight crime and the forces of evil. My appreciation for the trio of female superheroes is more than just a yearning for the return to the good ol’ days. “The Powerpuff Girls” should leap into action once again and this time, they need to save children’s television. Modern television shows are inundated with the traditional depiction of the male superhero – think Marvel’s “The Avengers” and DC Comic’s creations. Although there are female characters who fill key roles in the plot, they often don’t become the central focus because of their skill and are rarely responsible for saving the day. “The Powerpuff Girls’” feminist foundation is a healthy alternative to this cookie-cutter way of thinking and serves as a juxtaposition to the outdated model that supports male dominance and female subordinance. The girls’ representation through their colors challenges the depiction of gender in media. Whereas convention dictates that blue and green are “boy colors,” both Bubbles and Buttercup proudly wear them at all times, defying typical gender molds. Although they are by no means adequately inclusive, the superheroes do not strictly represent the traditional blonde haired, blue-eyed American girl. It is noteworthy that Buttercup has short, jet black hair and Blossom has red hair. The girls are known for their superhuman capabilities and their effectiveness in fighting crime. They always prove their strength against the odds. The Powerpuff Girls are not idolized for their sexuality nor for their ability to seduce. Blossom, Bubbles and Buttercup are depicted as competent individuals who refuse to be treated like innocent little girls in a traditional societal frame. The male mayor of Townsville, USA frequently requests the aid of the Powerpuff Girls – he is completely dependent on them for the town’s salvation. With the fact that the girls are raised by a single father, Professor Utonium, the show once again deviates from the nuclear family model. The girls save the day, while the father plays the role of a domestic figure. The premise of “The Powerpuff Girls” undoubtedly faces a multitude of problems. Townsville, USA is repeatedly saved by an all white band of adolescent girls. 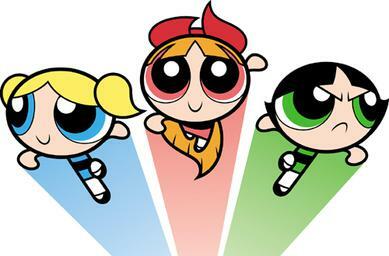 Blossom, Buttercup and Bubbles are made of “sugar, spice and everything nice.” Keeping this in mind, I am curious to see how the show will evolve in accordance with today’s television standards. While the old Powerpuff Girls are far from perfect, their return is a step in the right direction for female superheroes. It’s been over ten years since the last original “Powerpuff Girls” episode. While talk of a “Powerpuff Girls” return had floated around the Internet, I knew to shrug off the delusion. Sadly, the animators at Cartoon Network didn’t. I am a huge “Powerpuff Girls” fan and that’s what makes the new interpretation especially hard to witness. The nostalgia and memories have long worn off. The new “Powerpuff Girls” are a nuisance, deviating far from the original glory of the show. I’m saddened for younger generations that will be subjected to this lazy Cartoon Network reboot. To the ’90s kids, we have got to do better. We’ve foolishly encouraged this renewal and now have to deal with the repercussions. This desire to resuscitate the past has allowed nostalgia and sentimentality to blur memories from childhood. The original cartoon often ridiculed Blossom for her leadership, while Bubbles’ emotions got the best of her to a disappointing degree and Buttercup was mocked for her masculine tendencies. Sure, each episode attempted to redeem these idiosyncrasies, but in reality the show watered down feminist ideals and reduced girls to one of three personalities. The original “Powerpuff Girls” had its faults, but this more recent attempt to market girl power in pink, blue and green is nothing more than a money-making scheme to manipulate naive millennial nostalgia. “The Powerpuff Girls” was once about well-intentioned girl power and about using the best of your abilities to problem-solve and save the day. This new rendition of Blossom, Bubbles and Buttercup is so wrapped up in a desperate attempt to emulate pop culture it seems the creators have forgotten the purpose of the show. Watching Bubbles make an archaic “No Me Gusta” meme face and suffering through Buttercup awkwardly falling for an “I can’t even” joke physically hurts. There’s really no story left to tell for the quiet folk of Townsville, USA and it’s best it remain that way. Marketers want young people to believe that the Powerpuff Girls are still fighting crime and trying to save the world. Well, here they come just in time to remind us the past has been commodified and reduced to a shameful meme. Let’s face it, CN. Once you put twerking and messed up with, oh let’s see.. taking off important characters and such, you know you’re screwed.